Four ingredients (plus some chocolate chips thrown on top). And a microwave. Quite possibly the easiest recipe ever. I brought the fudge into the office yesterday and at least half of it is still uneaten. Definitely not a good sign. It’s not bad tasting, it’s just not wow! either. After reading all of the rave reviews, I was expecting this to be some amazing fudge, and I have to say I’m a little disappointed. I think I’ll be sticking with the other recipe (with marshmallow fluff) I tried a few months ago. Oh well! Microwave butter and peanut butter for 2 minutes on high. Stir and microwave on high for 2 more minutes. Add vanilla and powdered sugar to peanut butter mixture and stir to combine with a wooden spoon. Pour into a buttered 8 by 8-inch pan lined with waxed paper. Place a second piece of waxed paper on the surface of the fudge and refrigerate until cool. Cut into 1-inch pieces and store in an airtight container for up to a week. Another heavenly recipe! These sound amazing! TFS! 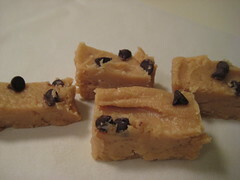 The peanut butter fudge recipe on my site is awesome! It might be the same one you use. I can’t make it anymore due to my son’s peanut allergy but before that it was one of my all-time favorite recipes. Never a good sign if you have free food left over… hmmmm…. Yeah, I agree, not a good sign. That happens to me too, isn’t it the worst! ?When you have a food blog or have otherwise set yourself up on this pedastal as a foodie. People have certain expectations, I hate to disappoint, very frustrating. It’s so frustrating when a recipe doesn’t live up to the hype. I just use the recipe on the fluff jar. Works every time. Yep, the rate that food disappears in the office is definitely the “acid test”. We’ve all had it. I always have to resist the urge to force people to take it…..perhaps that’s why I’m in a room on my own?